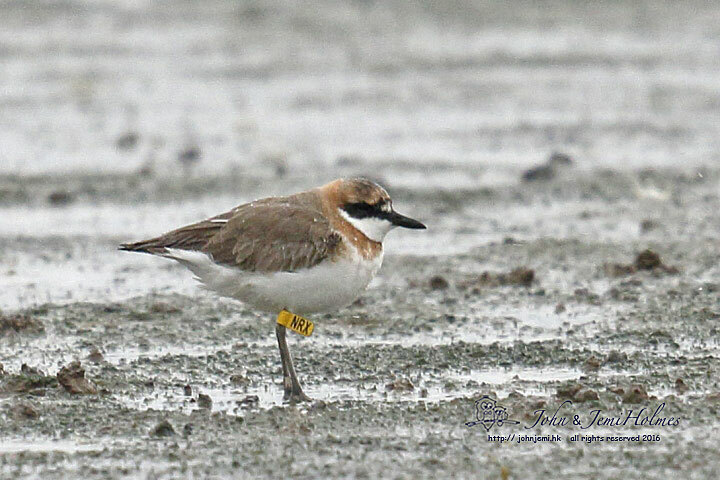 With only a handful of China records, and Hong Kong's first bird around various places in Deep Bay for four months or so, another appeared today, 19th April. 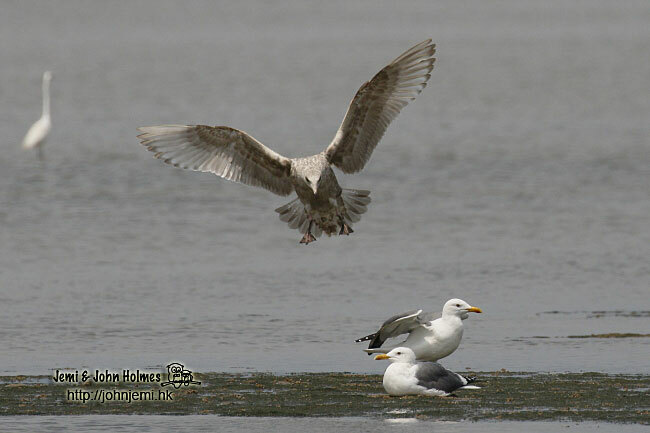 The Franklin's Gulls are behaving like buses - you wait ages for one, the TWO come along at the same time. Thanks to Ivan TSE for spotting the second. 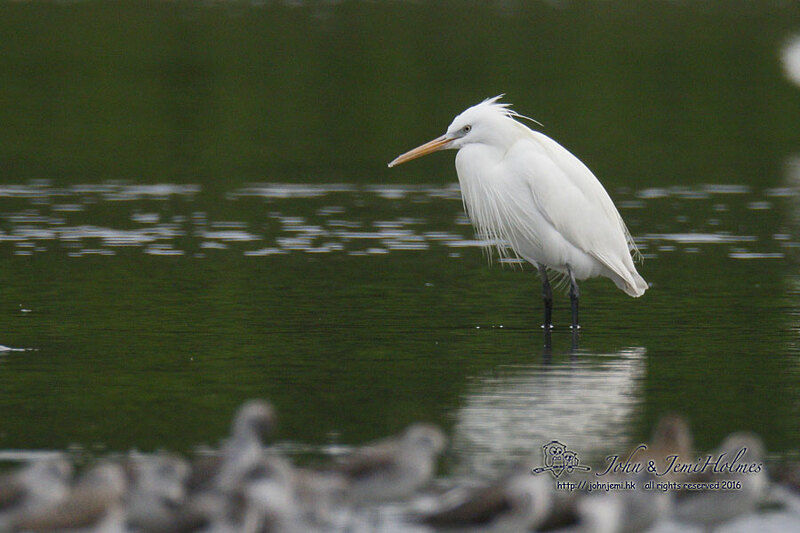 I had noted the first and then moved on to look at egrets. 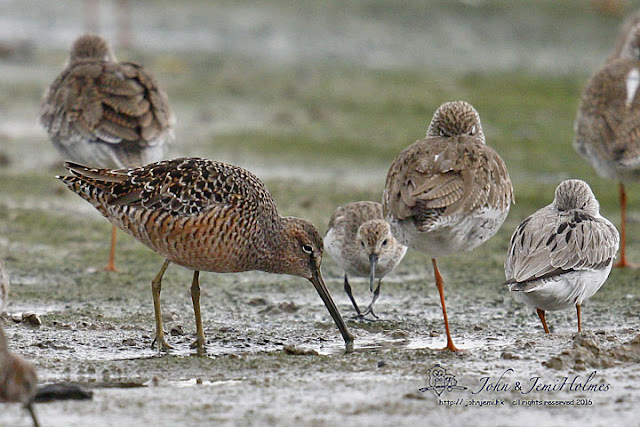 And many, many waders out there today, on a tide that just crawled under the innermost boardwalk hides. These shots are from yesterday, despite the rain, some decent birds came quite close to the outermost hide. 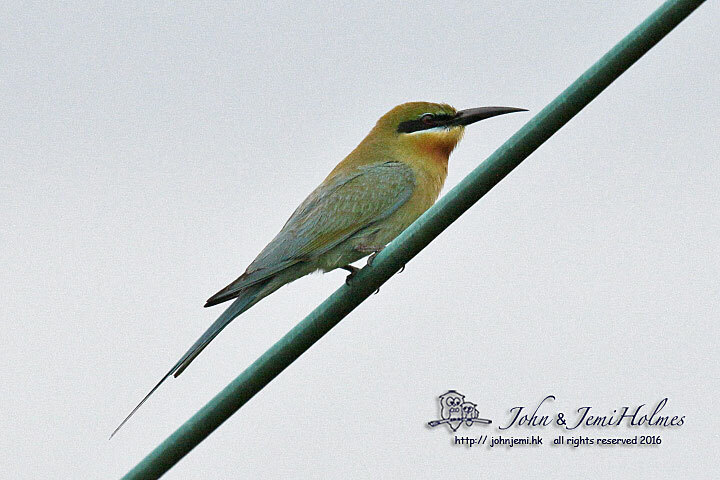 Worth getting rained on getting out there. 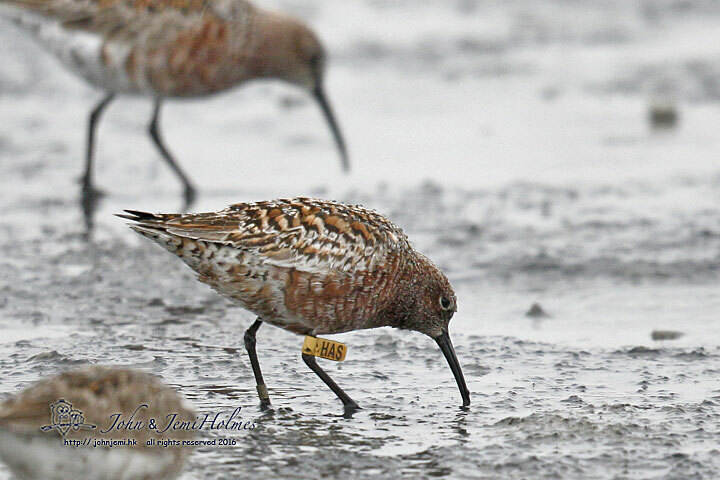 The flagged birds have been reported to the Hong Kong Bird Watching Society co-ordinator. 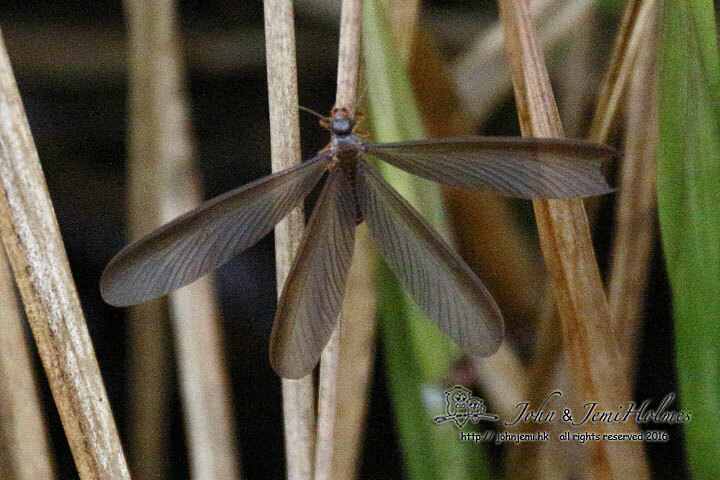 Gotta love April at Mai Po ! 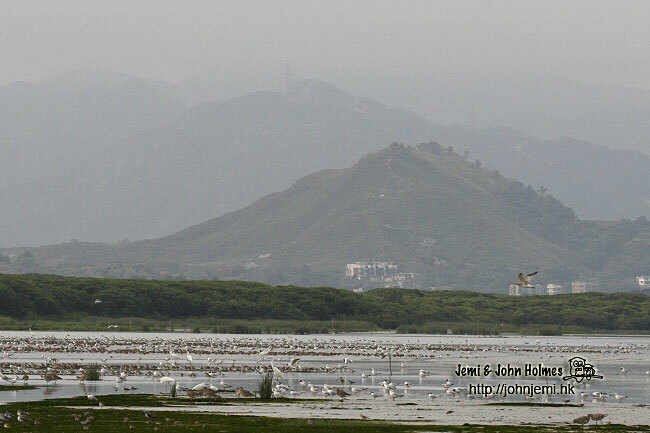 Once a month there is a Waterfowl Count in the Deep Bay area of northwest Hong Kong, centred on the Nature Reserve at Mai Po. 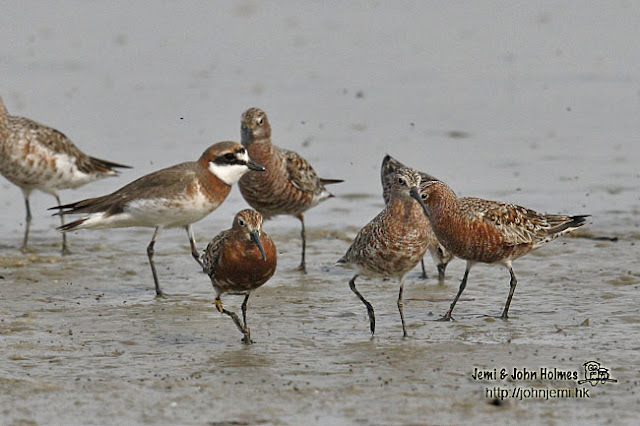 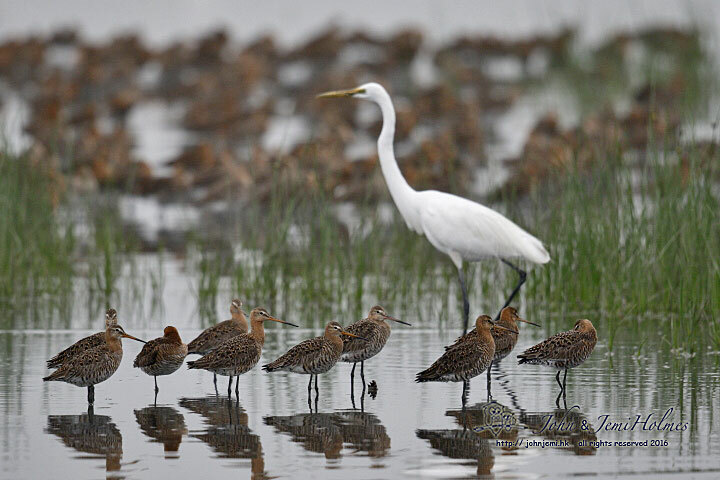 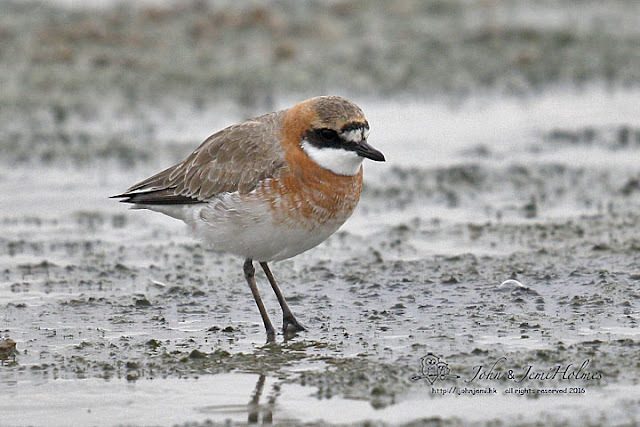 The Waterfowl Count is part of the Governments’ meeting of its responsibilities of monitoring the birdlife in HK’s only Ramsar site; - “Inner Deep Bay”. Depending on the season, the habitat where birds are to be counted is divided between about two dozen counting volunteers. 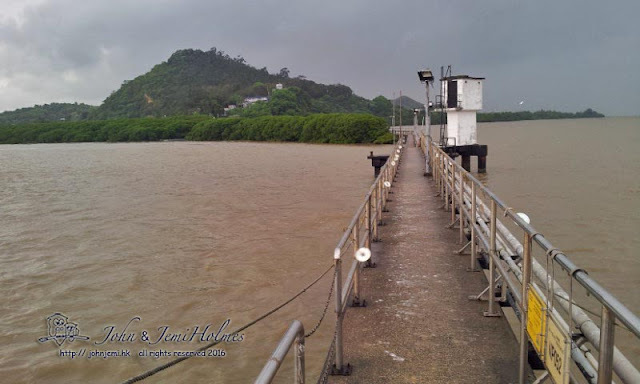 Last Sunday, I was assigned to count part of Deep Bay from the pier at Tsim Bei Tsui, followed by the coastline between there and Nim Wan. 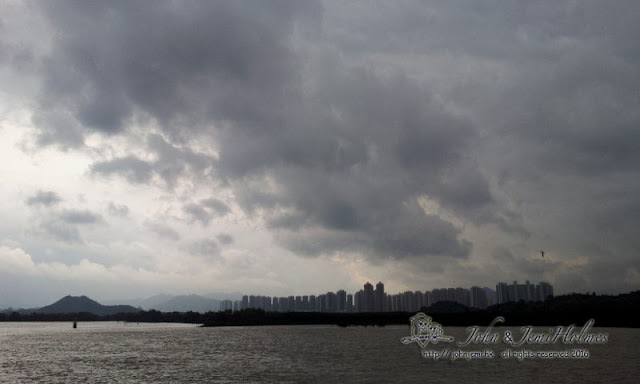 I’ve done this area before, but haven’t felt quite as exposed as I did when looking behind me towards the west and seeing some huge, black rainclouds. 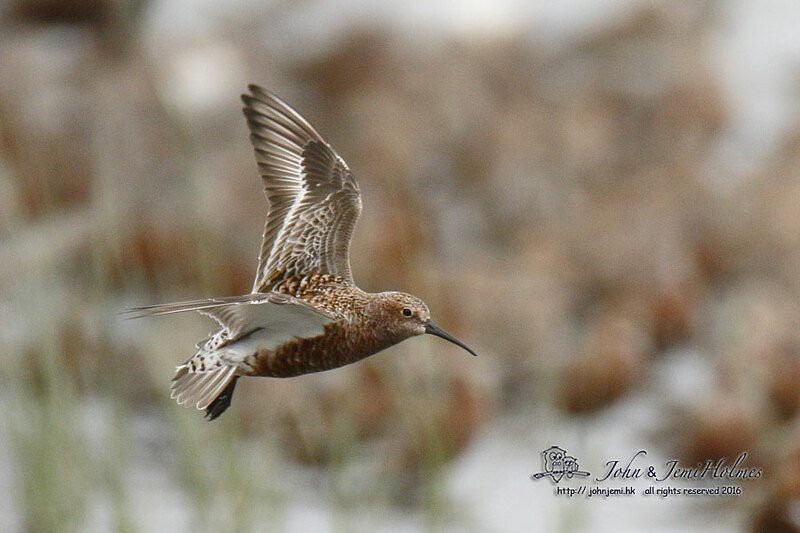 I managed to complete the pier section of the count, and scuttled back to the car before the first of several heavy squalls arrived. It was quite obvious along my route that most of the birds didn’t like rain such quantity either, and they remained mostly hidden from view, until I completed the survey near the landfill site at Nim Wan. On the way back I had reached Pak Nai when the rain eased off. 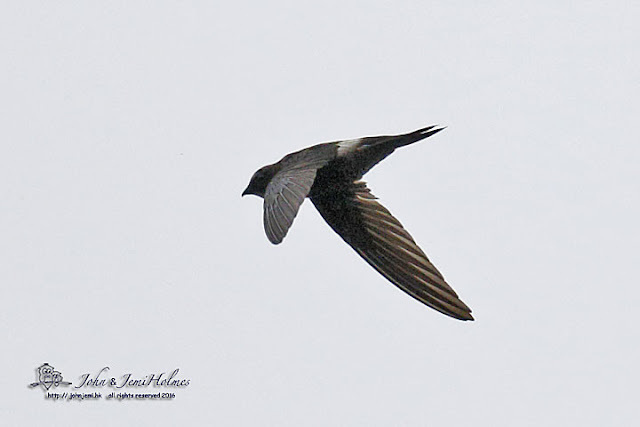 The weather had warmed a little, and I could see hundred of swifts and swallows circling in the still grey sky above. Starlings, both White-shouldered and Red-billed were active, too. 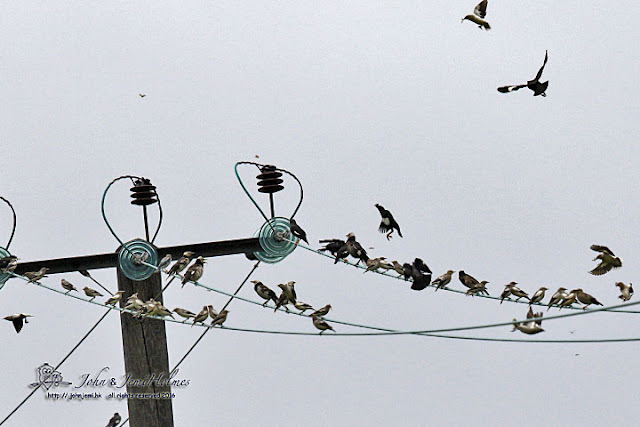 Many were perched on power lines over a grave and scrub covered hillside, together with Crested Mynas. Getting out of the car for a closer look there were about thirty Pacific Swifts in the flock, with two hundred House Swifts and a similar number of Barn Swallows. Two circling Blue-tailed Bee-eaters provided a vivid reminder that spring migration was in progress. 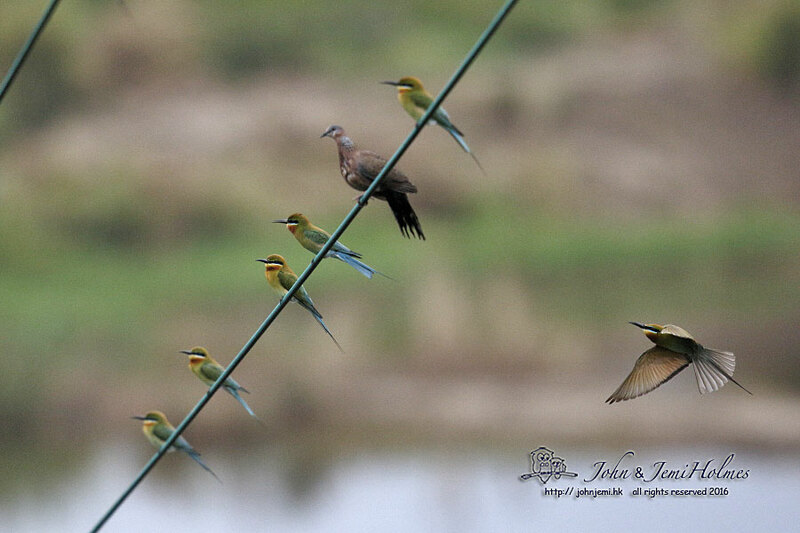 Many of the birds were hawking insects, mostly winged termites, which were swarming after the rain. 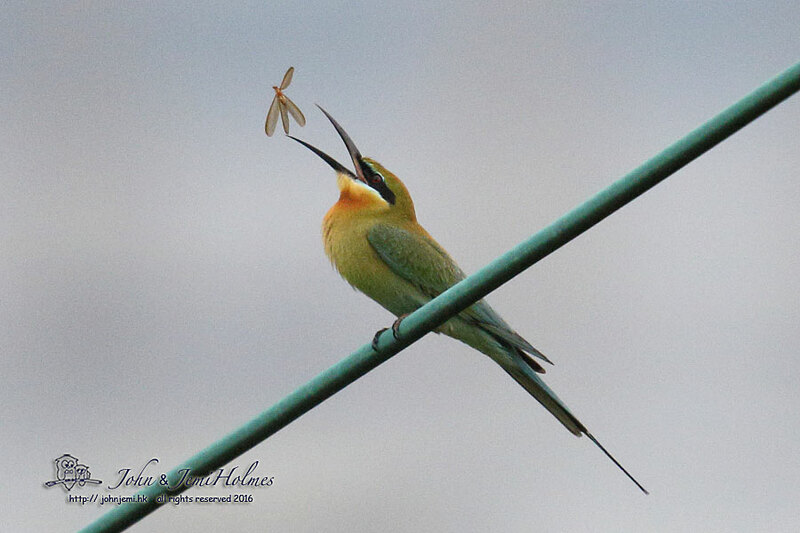 More Bee-eaters paused in their migration to enjoy the feast. 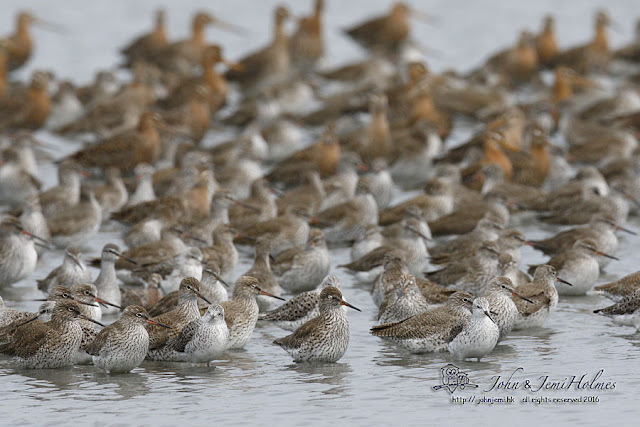 I counted nineteen in total. Looking at the wall of concrete across the Bay in Shenzhen, the attraction to the birds of a scrub-covered hillside in Hong Kong seemed obvious, and the presence of swarms of termites must have been welcome to wet and hungry migrating birds. 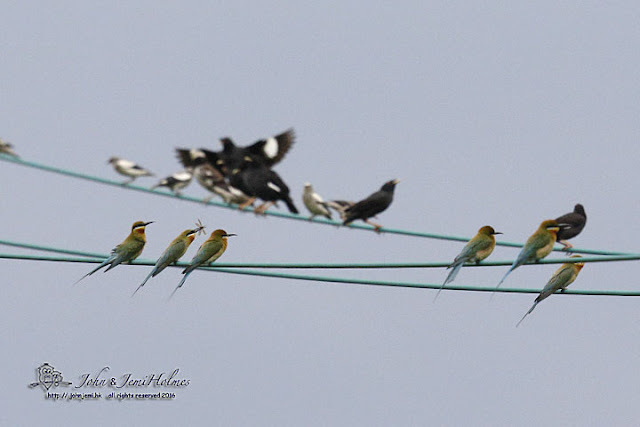 I managed to line up a few shots with a fairly neutral background, so that the birds, especially the Bee-eaters weren’t just silhouettes.The light was still lousy and (insert excuse here) the birds more distant than I'd have liked. Still, it all seemed like a bonus after the downpours earlier. 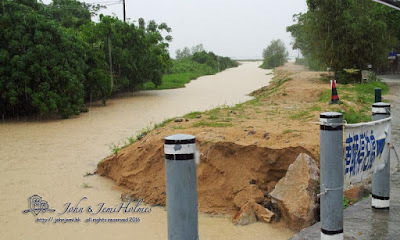 Turned out nice again ! 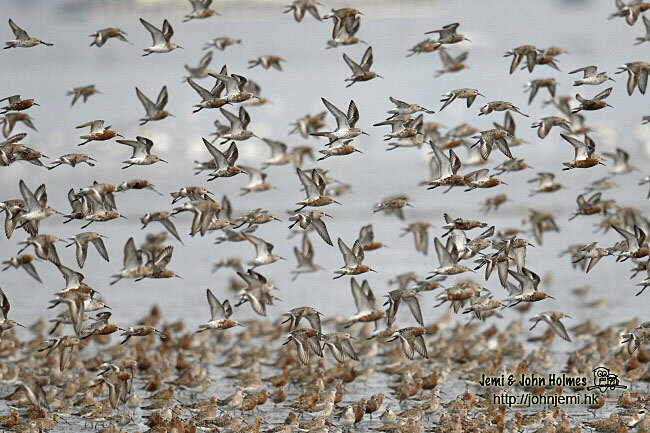 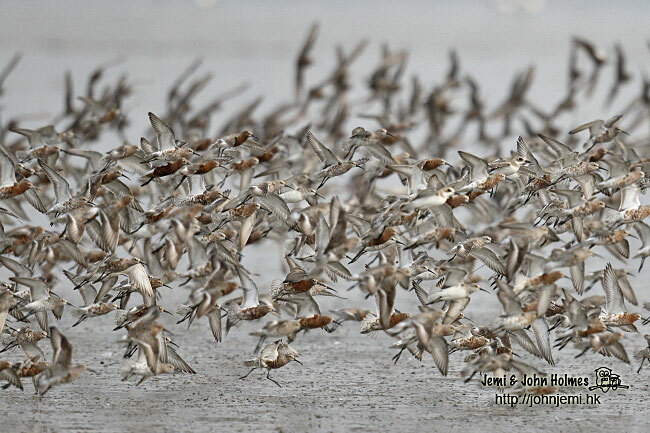 It’s April and the spring migration of many wader species is well underway. 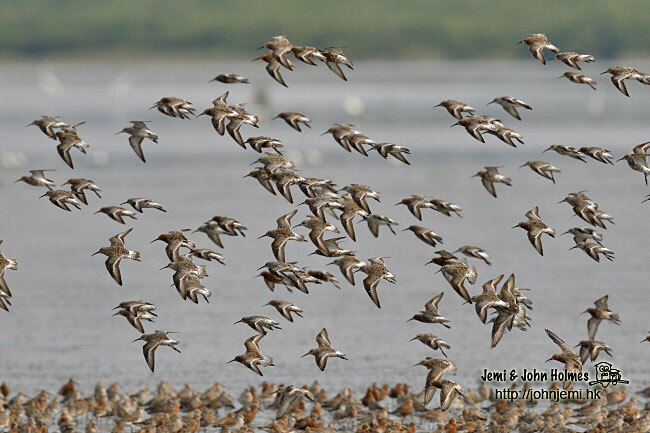 There's a fine variety of waders to be seen, if you can get the timing of tides right. 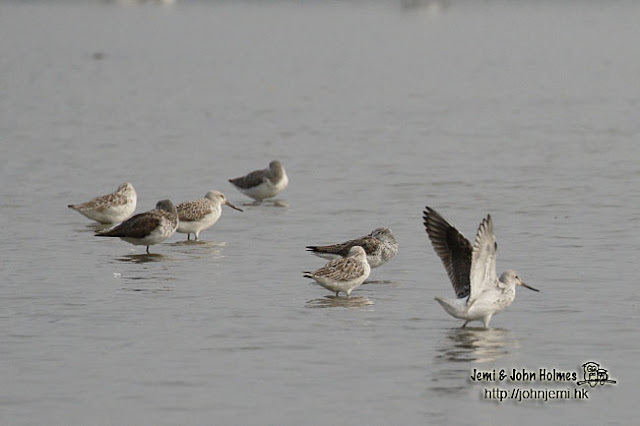 After a big thunderstorm on April 2nd, conditions have been fairly clear for the past few days, so there is a turnover of birds, but they still need to stop and feed. Here’s a view of part of Deep Bay from the northernmost floating hide. 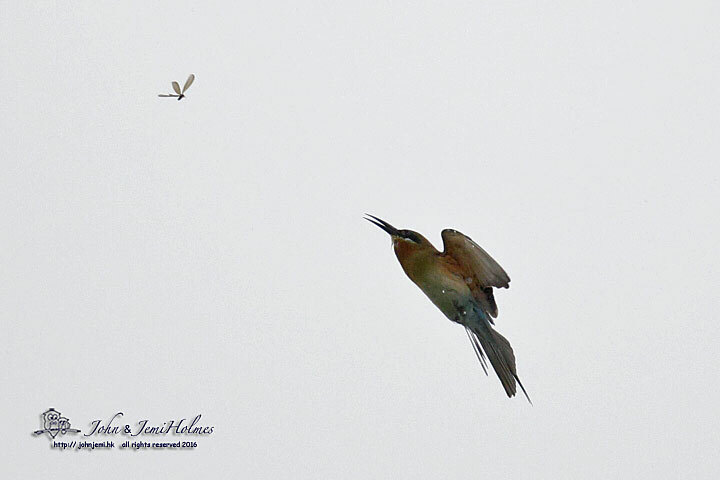 "Look Mum ! 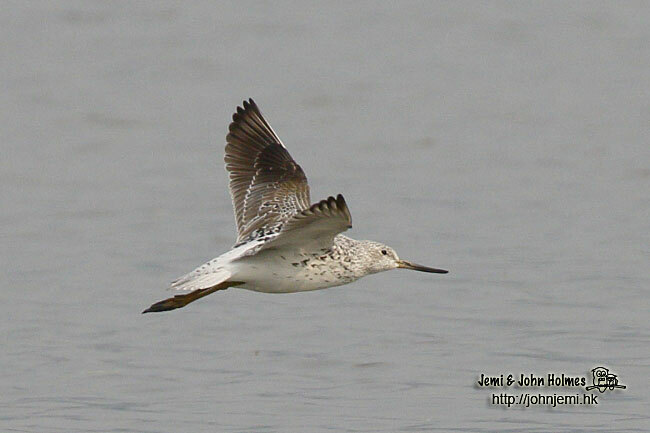 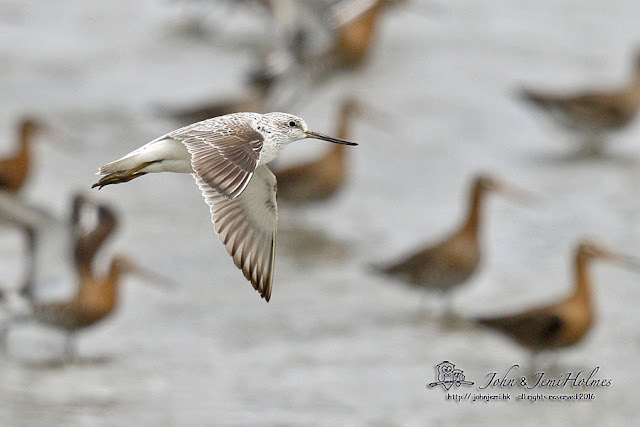 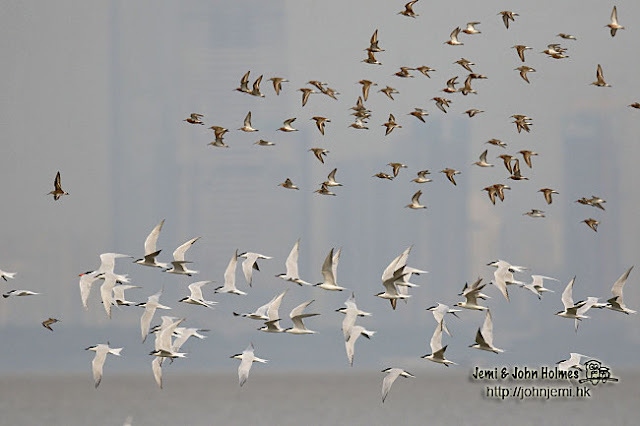 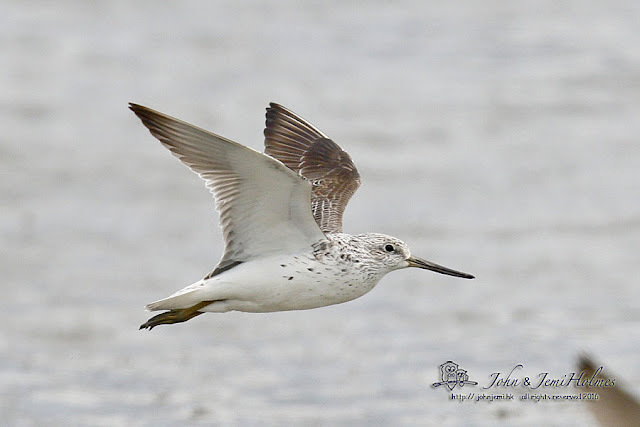 - No High Rise.."
Curlew Sandpipers are the commonest bird in front of the hides in Deep Bay this week. On 6th April, there were eight Nordmann’s Greenshanks on the tideline, returning the following day we didn’t see any. 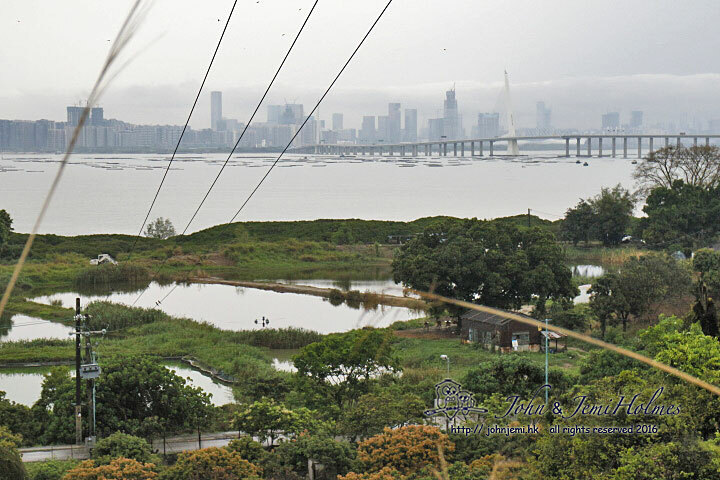 Perhaps some had moved on, or perhaps they were in a part of Mai Po ature Reserve we just weren’t looking at. 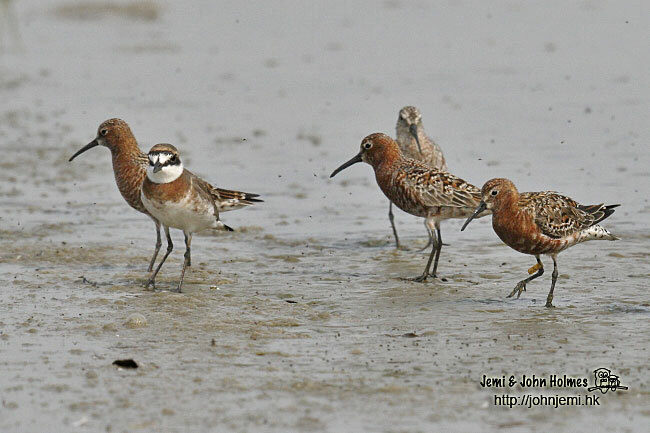 Anyway, it was nice to see a few of these Endangered waders. Four Nordmann’s and three Common Greenshanks in the photo below. 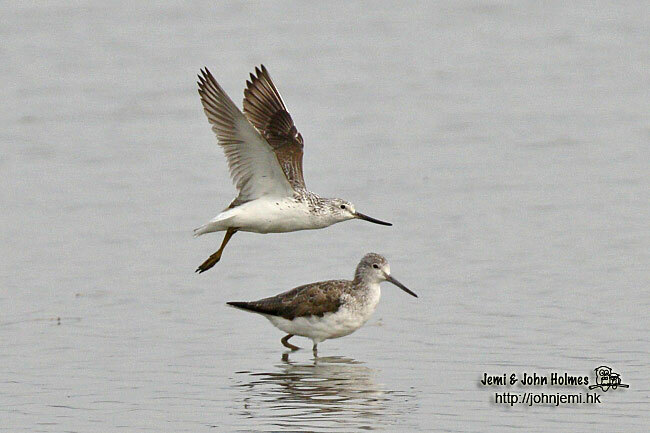 To help you work out which are which, here's a Nordmann’s flying past a Common Greenshank. On the outgoing tide, as is their way, some gulls dropped in. 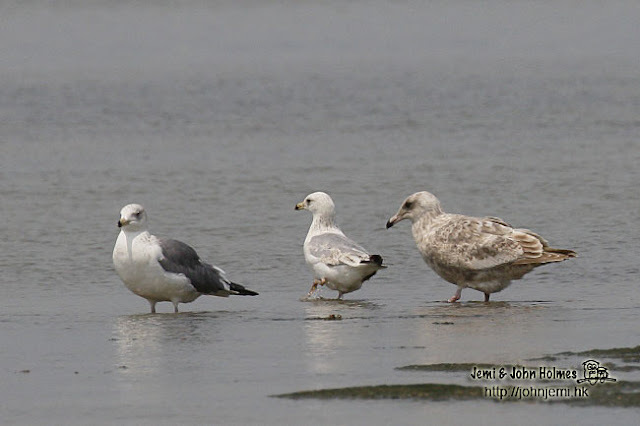 I'm reasonably confident that the one on the right is a first or second year Slaty-backed Gull. 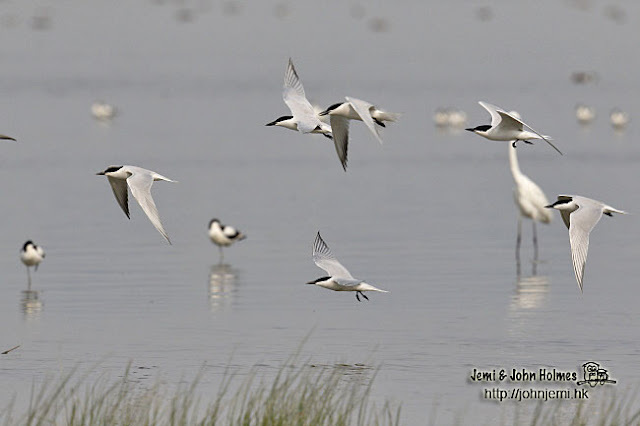 Gull-billed Terns are moving through south China right now, too. 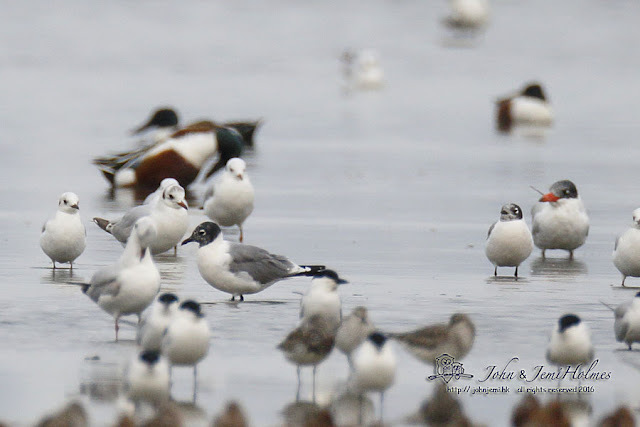 A single Caspian Tern near the front in the top photo. 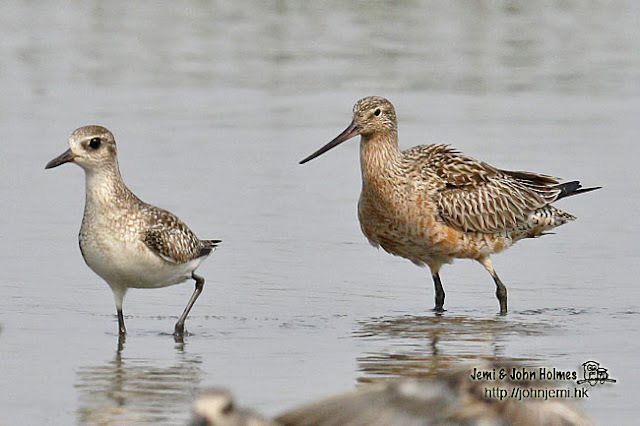 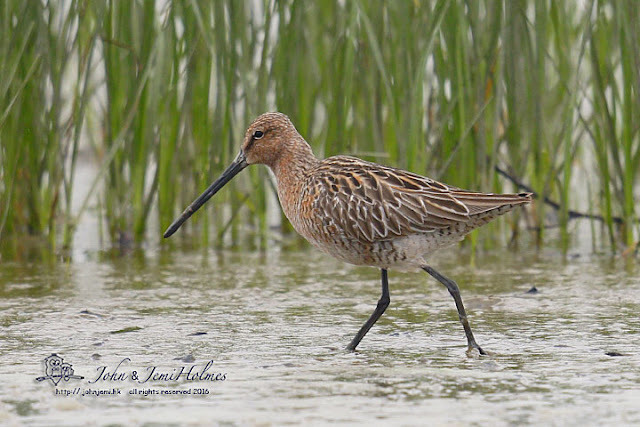 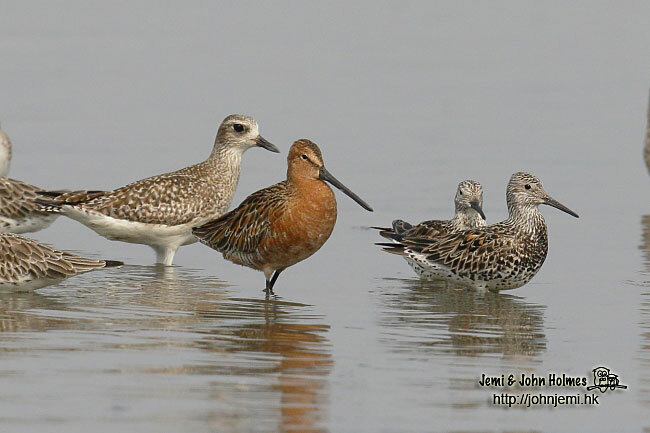 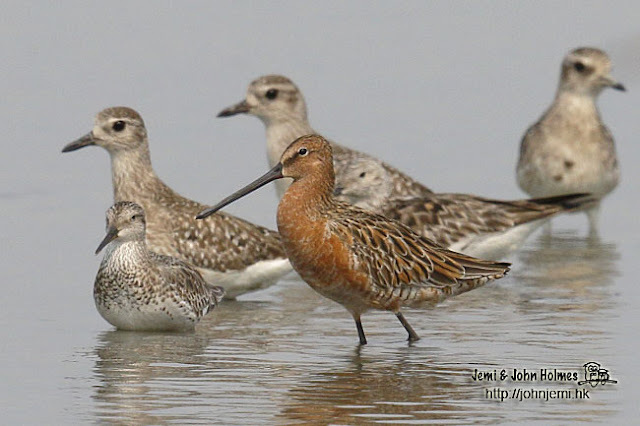 Bar-tailed Godwit (r) - most of ours are of race menzbieri. And finally, a spanking Asian Dowitcher. Not many passerine migrants about at Mai Po just now, but the waders more than make up for that !